We're the perfect pit stop Eastland Suites Hotel & Conference Center Bloomington, IL. Style, charm, and everything you need. Our boutique hotel will take your road trip to the next level. We've thought of everything and can't wait to see you pull up out front. There's nothing quite like a road trip. And there's no stretch of highway like Route 66. Windows rolled down. Tunes jamming as the odometer clicks by. And when it's time to pull over, Eastland Suites Bloomington is the perfect rest stop. A mix of charm and character (and plenty of modern amenities), we're at your service. We're the perfect pit stop. Style, charm, and everything you need. Our boutique hotel will take your road trip to the next level. We've thought of everything and can't wait to see you pull up out front. There's nothing like unfolding yourself from the car seat and dipping right into the pool for a swim, or working up a sweat to work out the kinks. Your back will thank you later! It's been a long ride and now it's time for some refreshment! Join us each night for two complimentary drinks at our nightly happy hour. You're bound to strike up a conversation or two over sharing tales from the road. Leave the evening's driving to us! (You've done enough for the day.) Our shuttle will make sure you get to your destination and back again safely. We get it, a good road trip takes time. Maybe you need to wash some of the clothes you packed along the way? No problem! We have coin operated machines at your disposal. We even provide the laundry soap. Your four-legged friend has been busy all day hanging his head out the window and barking at cars. Now it's time for him to stop by the front desk for a treat and snuggle up on the bed for a nice restful night of sleep. Just because you're out of the car doesn't mean you need to be inside. 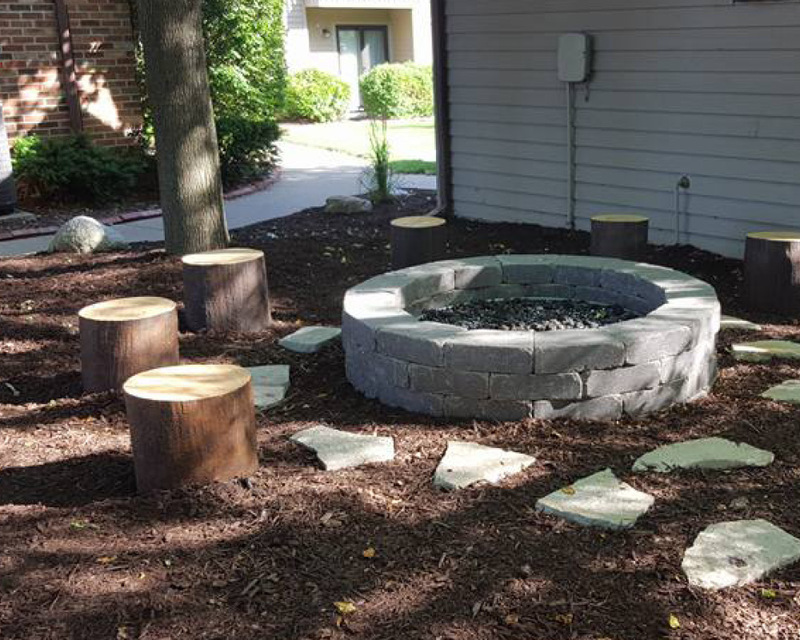 Stretch your legs and take a walk in our beautifully landscaped courtyard or relax by the fire pit.